Great friends, busy schedule, and who doesn’t love family time and time spent with friends….but yet – why do we still feel lonely? Author Erin Davis and many others can relate. In her new book Connected, Davis talks about the pain of loneliness while “swimming in a sea of people”. Follow along with Davis as she tells of her journey to “cure” this epidemic. Trying various things from a Social Media Fast to not using anything “automated” at all, she shares in a fun but truthful fashion the struggles of being lonely and disconnected. As I read this book, I found my shy, isolated self completely relating to what she was talking about. Most people that truly know me, know that I’m an outgoing cut up – kid at heart and just love each and every day. I love people and meeting new people on any level isn’t a problem for me. But, they forget about the “loner” that lives within my heart. The girl that loves doing things alone, being alone, and thinks that watching a movie in a theater and NO one else being there is a gift. There is just something cool about it. So many people are lonely and have no clue what to do to break out of the cycle. It seems to be a never ending curse. Sometimes we have to step outside of our comfort zone and chat with people. Sometimes we have to put a halt to our busy schedule and make time to have lunch/dinner with those we love and adore. Sometimes we have to put down the phone and play in the homemade fort that is taking up the living room. Author Erin Davis shares several things that she did on this journey that you will find helpful and may spark other ideas as well. May I add a few thoughts to help you connect as well? Eye contact – for everyone! Your spouse, children, friends, family, etc. They will know beyond a shadow of a doubt you are paying attention to them. HUG – Hugs are awesome. Seriously – go hug someone. When you are at a restaurant, bank or store and the person helping you has on a name tag, USE their name. Especially when saying thank you. Schedule time with friends and family that live outside your home – We try to get together often. Don’t wait until a funeral to come together. Schedule monthly meals somewhere and those that can come will and those that can’t, maybe the next time they can. At Church, take some time to greet others. Speak to others instead of rushing through the service and time. Shake hands with someone you don’t know. Help a mom get her children to the nursery. Say something encouraging to the Pastor, Youth Pastor, or Assistant Pastor. Lastly – there is no right or wrong way to set limits with your technology/Social Media use. I love technology and depend on it to keep up with my son who is 3 hours away and my daughter who is 14 hours away. I love being able to keep up with family that is not close as well as encourage those around the globe via Twitter. But, there are limits I personally set. For instance, I have NO notifications coming to my phone. Zero. Other than texts and calls I get my emails and other notifications when my time permits it. When we have dinner, it’s been cell phone free for years. We even had our children do the same when they were growing up. Again, no right or wrong way, just find out what works for you. I love this book and I’m thankful for BH Publishing Group for allowing me to give away a copy of this book for you. Directions below on how to enter to win. There is a section in the back where you can use the question to connect with God and with others. It’s a great book to use as a Bible Study help or in a Small Group/Sunday School setting. Her website also has some “freebies” – Verse Cards for you to use. Check it out here! Hey y’all. This giveaway has officially closed, but we’re really happy you’re here anyway. You can always take a peek at our current giveaways! Loneliness has a way of jumping over all geographical and social boundaries. Knowing and being known only happens when we allow the roots of our relationships to grow deep. (In regards to God’s love being a precious gift) – Being so intimately known is the vaccination we all need to cure our deep feelings of loneliness. Yes, Jesus loves me this I Know. But when loneliness comes, I need to be reminded that Jesus KNOWS me. This I love! 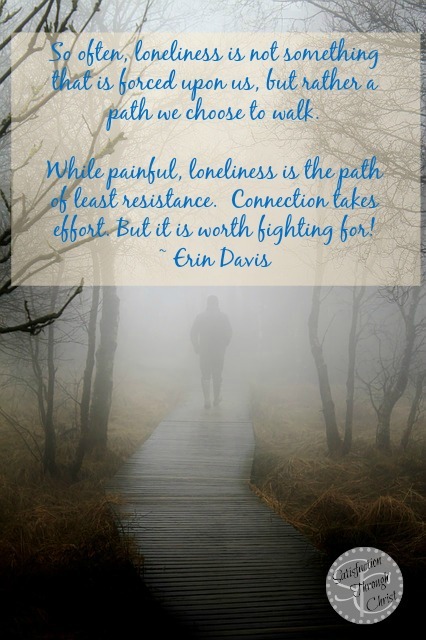 So often, loneliness is not something that is forced upon us, but rather a path we choose to walk. While painful, loneliness is the path of least resistance. Connection takes effort. But it is worth fighting for! What are your thoughts about being lonely in a sea of people? Do you struggle with this? How do you connect with others? Wife, mother and I am a lover of the million little things that make life BIG! I love old books, hot coffee, the laughter of children and the priceless hugs that mean more than anything. 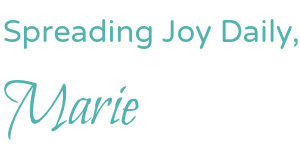 While looking through the eyes of compassion and understanding the heart that desires to have an impact, Marie encourages others to see the full potential of the everyday, ordinary resources that is right within their reach. Everyone needs to make a difference and with creative thinking and a unique look at the ordinary; she shows people all over the world just how easy it is to make a difference. Every act of joy that you do, regardless of the size, has the potential to have a limitless ripple effect. You never know where your act of joy will end up. You, the giver, are splashed with joy as you make a difference! God’s Joy is for everyone! I’ve been able to feel much more connected now that I’m not working full-time and have energy to invest in friendships. It still sometimes feels like I’m alone as people can be very busy. Lost my hearing at 39 due to BOR syndrome which I had no clue or understanding of. I was always a people person and this was traumatic and heartbreaking as my then husband considered me broken and useless. However, the blessing came because I never stopped hearing Jesus voice in my heart and soul. 13 years after I became deaf I was implanted with cochlear implant which is almost like normal hearing if I am doing one on one in a quiet environment. Social and group activities are out unless I just sit and smile because I hear all the noise, everything around me without ability to discriminate. So yes, I feel lonely, but then I look at faces. I have always had a very intuitive ability to know what people’s moods/feelings were even before they did. So I see sadness or pain or happiness and I sit and smile and pray for those around me. Jesus and I have our own party so to speak and it is through Him in my life that I have been blessed by my deafness. He also sent a hearing man who became my precious hubby. He spoke and signed the first 5 years of our marriage, never expecting anything more. The CI was truly a precious gift! I am blessed with a dear, dear family and friends and blessed to feel connected with them. I love to read and to be inspired, so I’d be thrilled to win!